If you were looking to buy a new diesel truck and I told you that the Duramax brought additional horsepower to the table over last year's engine you might stop to consider it a worthy contender. If I told you that the table was shattered with 765 foot pounds of torque (up from 660 in last year's model) I'd get your attention. You might ask, extra horsepower and torque are great, but how much am I gonna pay for it at the fuel pump? As Joel Paynton pointed out before the new Duramax's release this Summer, the engine actually produces all that additional power while improving fuel efficiency and emissions. Now we learn from GM that the improved fuel economy may be as high as 11 percent. They also managed to make the EPA happy, or maybe just a little less unhappy, by reducing NOx emissions by at least 63 percent over the 2010 LMM. 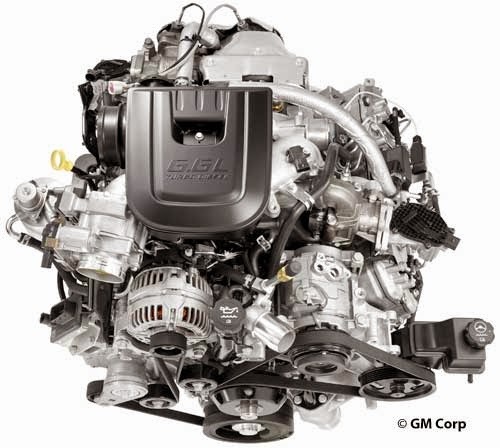 How did GM pull it off: more power on less energy? GM's press release boasting of the 2011 Duramax offers some clues. In this article, we will investigate some of the mechanical wizardry that made it possible. Let's look at these one-by-one to discover why they make the LML stronger and more fuel efficient at the same time. The main bearings connect to the front and the rear of the crankshaft. By slightly enlarging the main bearings, the thickness of the oil film increases. This increase in film strength allows the crankshaft to sit further away from the bearings. The result? Each turn of the crankshaft produces less drag. Drag occurs between the crankshaft and the bearings because of the extreme pressure that occurs between them. Oil, under normal circumstances, possesses liquid properties; however, under extreme pressure, like that which occurs in the crankshaft, the oil film thins and begins to act more like a solid. Instead of allowing the crankshaft to roll freely as it should when surrounded by lubricating oil, friction (drag) increases as if the crankshaft were rubbing against a solid (even though a very thin oil film is still, present). When a thicker oil film is present, as a result of the heavier duty, bigger main bearings like those in the LML, the oil film thickness increases and the oil tends to maintain it liquid characteristics, meaning less drag. At 1,500 revolutions in one minute, the decreased drag with every turn of the crankshaft means improved efficiency 25 times every second. At 3,000 RPM, the reduced drag burns less fuel 50 times a second. Of course reduced drag means being able to produce the same amount of power with less fuel: it also means that if you use the same amount of fuel as in the LMM you will get more power, a fact reflected in the LML's higher power ratings. While the beefier fittings positively affect fuel efficiency and power output, the only negative impacts should be the additional cost to manufacture the bearings and a little bit of space since they would take up more room in the engine. Perhaps the increased cost involved in the bearings led the GM engineers to only replace the main bearings and not the eight connector rod bearings but it also makes sense from a mechanical perspective. While the main bearings are constantly engaged in the transfer of power between it and the transmission, the connector rod bearings only transfer power to the crankshaft during the power stroke; that is, improving the film strength for those bearings through the expense of making them bigger would only yield improved fuel efficiency or power following combustion in one of the eight cylinders with no net improvement during the intake, compression and exhaust strokes. Another reason to not use bigger bearings for the connector rods? Right. Increasing the space inside the bearings increases the potential damage caused by the rods as they hammer down on the bearings during each power stroke. Any significant play means deformed bearings sooner or later. At the very least, using bigger rod bearings would necessitate using a heavy viscosity (lower fuel efficiency) oil to insure proper film strength in those bearings. These issues, on the other hand, are not present with the main bearings. Increasing the oil flow through the engine follows the use of the enhanced main bearings discussed above. While it may not be an absolute necessary modification, it will probably save GM and GM technicians a lot of headaches from drivers worried about the oil gauge reporting low pressures. The oil flow through the main and connector rod bearings are key to the oil pressure reported on the dash. Just as any liquid will flow more easily and at lower pressure when it is flowing through a less restrictive space, increasing the size of main bearings means that the oil that flows through those bearings does so at lower pressure, unless you increase the flow. It seems likely that rather than cause panic among Duramax drivers when they see 15 PSI oil pressure, GM simply decided to increase the flow of the oil and, by doing so, maintain popularly acceptable oil pressure levels. In truth, high oil flow, as opposed to oil pressure, is the critical measurement for the well-being of the bearings. While it may seem to make sense that higher oil pressure would result in more clearance between the bearings and the crankshaft or connector rods and while that line of reasoning is accurate for bearings found in turbines, it is not true for the bearings used in the Duramax: so it is high flow, rather than high pressure, that improves performance. So, increasing the oil pumps capacity for the LML provides peace of mind for owners and simply peace for GM. By increasing the oil pressure at the turbo, GM pushes the oil through the turbo faster. At first, it might seem like this would limit the oil's ability to pull heat away from the turbo since it is spending less time than it would be at a lower pressure/slower speed. The opposite is true however. Just like a higher volume of water flowing over an ice cube will cause it to melt more quickly than a trickle, faster flowering oil means a higher quantity of relatively cooler oil running over the hot turbo, pulling the heat more effectively while it also spreads the heat that is removed over more oil so that the oil does not get as hot. So more oil at the turbo means more cooling capacity and less heat transported to the same amount of oil. More horsepower, more torque means that the engine components needed to be beefed up in order to handle the extra power. Modifying the pins and beefing up the pistons equips the new Duramax LML engine components to handle the increased power. The "higher-strength piston design" allows GM to produce a lower weight piston assembly so that each powerstroke can focus more on converting the energy from combustion to the crankshaft and be less occupied with using the same energy to power the motion of the pistons themselves. Just as the modified bearings resulted in a net lower drag with each turn of the crankshaft, the lower weight piston asembly means less energy is required to power the pistons themselves and more energy translated to the crankshaft. Dan Watson covers this aspect of the Duramax LML in depth in depth in his "The Ninth Injector" article. In summary, GM has taken the lead to avoid the fuel contamination issue that appeared with the introduction of the regeneration cycle for the diesel particulate filter. Forced to hastily comply with new EPA standards in 2007, GM, Ford and Dodge all decided to flood the exhaust system with fuel from the engine's standard injectors. The fuel was burned and the immense heat served to purge the DPF of the soot it had collected. The system, however, allowed diesel fuel to get into the engine oil and presented issues, especially with those drivers using synthetic oil such as AMSOIL to extend their drain intervals to one year and 15,000 miles and up (end shameless plug). Now, GM has a dedicated circuit that sends fuel directly to the DPF for the regeneration cycle and avoids that fuel contamination. No word yet on when Ford and Dodge will catch up.